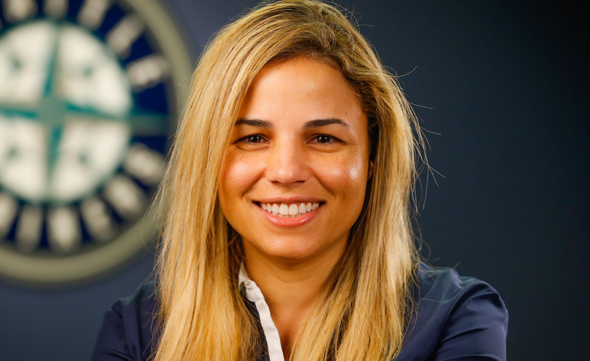 Mariners strongly deny allegations made by high-performance director Dr. Lorena Martin, fired Oct. 10, that officials made derogatory remarks about Latino players. Well, that hire certainly didn’t go well. Dr. Lorena Martin, seen a year ago as a cutting-edge figure, in the sport — the Mariners’ first director of high performance — was fired Oct. 10 and unleashed Monday a social media tirade against general manager Jerry Dipoto, blaming him for a culture that produced derogatory racial remarks she alleges were made by club officials about Latino players, and also firing Latino trainers at their Dominican Republic facility. Monday night, The News Tribune reached Martin by phone. She elaborated on what was said by whom. Martin told of another episode at spring training about a disagreement with Dipoto over who had responsibility for mental skills training, her or McKay. Dipoto repeatedly punched a white board when she mental skills training was part of her contract. “Just this really aggressive behavior to intimidate me,” Martin told the News Tribune. “And he says, ‘This is (expletive). You keep getting after Andy.’ I said it had nothing to do with Andy, it’s just in my contract. And he kept punching the wall in the office, like big time. The Mariners late Monday night offered a denial to the Seattle Times about Martin’s recollections to the News Tribune. Prior to her Mariners hire, Martin, 38, worked as director of sports performance analytics for the NBA Los Angeles Lakers. She had a Masters degree in psychology from Nova Southeastern University, a Ph.D. in exercise physiology from the University of Miami, and three post-doctorates in spatial analysis, biostatistics, and epidemiology from the University of California-San Diego, and was fluent in Spanish. “Lorena’s background, skill set and previous experience make her a perfect match for what we envisioned. Major League Baseball has lagged behind many professional sports leagues, including the NBA, Premier Soccer and others, in using big data to assist in both injury prevention and peak performance. A Seattle Times story Monday said some players were slow to adapt to her recommendations, and consideration was being given to limiting her role in 2019 to the club’s training facility in Peoria, AZ., and the minor league system. Most of us have had girlfriends or boyfriends like that. It’s all fun and games til the honeymoon turns to just plain old mooning. Wow . Well , she certainly seems to have specific quotes and incidents recalled – nothing vague about it , which would seem to lend credence to her claims . But it seems hard to imagine that’s the culture in the organization and none of the other players or coaches haven’t made similar claims . If it’s true , it’s disgusting . The racial bias that’s come out of the closet since Trump was elected is reprehensible . Yeah. Because there were no such racial incidents before Orange Man Bad came along. I wondered when you were gonna come back out of hiding , it’s been a while . Except for the notable increase in documented, proven, publicized, often-called-out-except-for-the “good-people-on-both-sides” fiasco, and other “incidents” since Drumpfh joyfully besmirched the entire place. Be honest–we started retreating during a particular administration when the guy in charge was guilty of PWB, e.g. Presidenting While Black? Again, don’t connect dots that aren’t there. I like it. A MAGA original. I wouldn’t connect anything to this episode until we know more. Yet another mess in a joke of a franchise – The M’s have been the dregs for so long it is the norm. Want to sink into oblivion as a player? Go to the M’s. Their farm system has sucked for at least 15 years, and the only reason they picked up stellar talent like Griffey and A-Rod is because they were last place losers and got the 1st draft pick. Otherwise, their farm system had produced zilch. Why have they never picked up a Bean or Epstein 2nd in command? Their GM’s after Gillick are just a bunch of Clowns whose only “talent” appears to be to sign over the hill players to contracts so sizable the rest of the GM’s must think this is an asylum. The only feasible solution is for the team being sold to an entirely new group with NO connection to ANY prior M’s ownership or management. Even the new group is showing how inept they are, after what, 2 years? Don’t paint Dipoto with the same brush as the others, although even if none of Martin’s claims are true, his hiring/handling of her and the job was a disaster. With this news and from this past summer of Mariners executives being accused of inappropriate workplace conduct by three female employees I think it’s safe to say that the culture in the organization has problems right now. If the club is to offer full transparency I’m curious as to why Dr. Martin (I noticed the club didn’t refer to her as doctor in their press release.) and the trainers were released. I’m also curious if any of this played a role in Edgar stepping down. In defense of the Mariners though if they thought so poorly of Latinos Felix wouldn’t be here as long as he has. I expect the Mariners feel obliged to clear all names publicly. IMHO there are two issues. One is the charge Lorena Martin has proclaimed. The second is the validity of the science of high performance. I think she sold the Mariners a bill of goods without the goods. All of these programs of excessive lifting, stretching, diet, icing, massage, meditation, electrical stimulus, etc. may have benefit for a one off performance but don’t seem to work for a season of anything. When athletes pop muscles lifting a dinner fork, it’s over training and not bad luck. agreed, regarding the ‘science’ of high performance: it sounds like the players didn’t really buy in. As for the rest of the allegations, who knows? I’d be very surprised if DiPoto said those things, but then again, I’ve been surprised before. Lots of people didn’t buy in to the notion that smoking causes cancer. The training she and others at her level engage in has more to do with psychological training, nutrition, rest and emotional balance. It’s legit. It works with many. The idea is to get athletes to perform at peak levels more often. Not too exotic for you, is it? That training might help some players. But it’s interesting that many of the greatest players of all time had absolutely no “emotional balance.” They were obsessive (Ty Cobb, Ted Williams, Rogers Hornsby). The nutrition and rest regimen of Babe Ruth, Grover Cleveland Alexander and Mickey Mantle would probably not be recommended by too many doctors either. These players may well have been the outliers, but it does seem that as baseball becomes more enamored with weight training and diet, more and more players spend weeks and weeks on the disabled list with pulled obliques. It makes me long for the days of Smoky Burgess, pushing 40 in both age and waist measurement, waddling up to the plate and hitting .300 as a pinch hitter. I can’t get a fix on her. On the one hand, U of Miami and UCSD are legit schools and spatial analysis, biostatistics, and epidemiology are rigorous disciplines. On the other hand, putting inflammatory words in all-caps is a sure sign of kookoo. note to Mariners: next time you go looking for a unicorn, try to find some kid who can throw the ball 100mph over the outside corner. How about a 3B who can hit .260 with 20 HRs 80 RBIs. We don’t know enough, although I must say that her handling of her grievances was done exceptionally poorly. It seems the Mariners are poised to take the baton from the Browns as the worst run North American professional sports franchise. I stopped following the Mariners when they helped tank the street vacation. This is schadenfreude at its best. Choose your target. They are plentiful. High performance director….sabermetrics…exit velocity….WAR….blah, blah, blah….I gave it consideration because of Bill James’ Baseball Prospectus years ago (and today, he’s in trouble)…and now, meh. Do I really need to know the speed and distance between a dancer’s feet to enjoy the ballet? The soul killing metrics and high performance regimens have stolen the very heart of the game. Baseball went from a two hour pleasant interlude, to 3 1/4 hours of mind numbing paralysis. Plus, we have never had so many injured players as today. More dynamic weight training and stretching? Seemingly every pitcher’s resume includes Tommy John surgery (he should have gotten a cut from every procedure). Can the Mariners just find a catcher who doesn’t swing and miss and strike out 40% of the time? How about finding a $24 million man who doesn’t jog to first base? Can a dead pull hitter actually LEARN to go the other way, or should he just continue to ground out to short right field (when he’s not striking out)? Can the M’s locate a pitcher who doesn’t fall apart after 15 starts and 90 innings? How about signing someone who can actually make contact, hit and run, bunt and move a runner? Or start 3-5 everyday players who can hit .270 and above? But, maybe I’m wrong…maybe there aren’t enough meetings on the mound with gloves over their faces, signs from the catcher to the infielders, cheat sheets in players’ back pockets…maybe we need even more home runs and strikeouts (the M’s struck out 1,221 times in 2018), less contact and fewer balls in play? Brilliant blog entry. Go to the head of the class! Excellent! I liked it; not being facetious. Thank you Husky 73 for an excellent post. Spot on!! Thank you Kevin and bev…I am humbled…but remain a peasant in Art’s kingdom…or Kingdome. Not sure what this has to do with Lorena Martin’s claims, but I’m guessing you needed to vent about baseball. You’re welcome. What’s most significant to me regarding the entire episode is how publicly it is being played out. I suppose I can understand the purpose behind Martin going public with her allegations, but find it curious that the Mariners would respond so thoroughly in public. Having the allegations investigated by MLB and then responding to its findings would seem to be a more appropriate path for dealing with this situation. Hard to tell what is happening here based on a few incendiary comments. But Martin’s assertion that “Servais told her that you don’t see Latino catchers or managers because “they aren’t bright enough. They are dumb.”” doesn’t appear credible on its face. There are lots of Latino catchers and a Latino manager just won the World Series. Servais would know that and surely avoid making such a palpably absurd observation, even if he were as biased as alleged. But still, the M’s front office has unresolved issues of sexism that were quietly swept under the rug, so Martin’s accusations can’t be dismissed out of hand. Last season’s collapse was a major disappointment and tempers have no doubt become frayed. The only thing we know for sure is that there will be no Lorena Martin Bobblehead Night scheduled anytime soon. Hilarious, about the bobblehead. Actually…you might be on to something. Create the bobblehead and give them out to the first ten paying customers who have a doctorate. They can then, with an extreme rarity, put those on eBay and…I don’t know, this could go somewhere. National story? I’m awaiting further testimony. No guesswork. Really? Dipoto and others stomping around unhinged and screaming racist comments about Latinos? I can easily believe some level of dysfunction, but not such widespread, open, rabid bigotry against half their personnel. Of course, I’ve been shocked before by the racism hidden in some ostensibly professional environments. But if Martin complained to HR as much as she claims, there would have to be some trace of it. To believe otherwise is to buy into a pretty extensive conspiracy and coverup. You know these people, Art. Is that possible? What I know about most people is that I don’t know them as well as I thought. Check your own circle for the times you were surprised.